Start as for Bombs Away to the second bolt, traverse left to the arête. 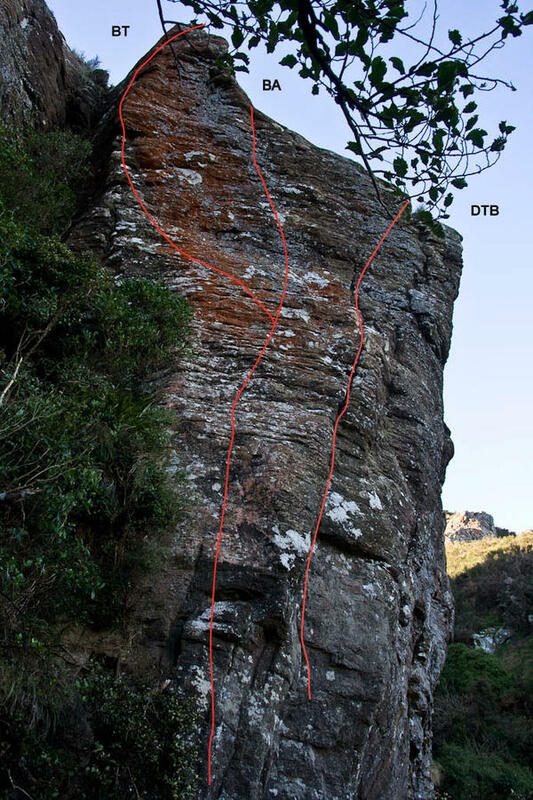 Climb the arête past four bolts to its highest point; belay as for DTB. Not as slabby as it looks – very steep in fact. Start in bushes at left. A few desperate tree moves allow rock contact and bring the first bolt within clipping distance (pro available before the first bolt), tricky moves lead up to next bolt, an easier section follows. The headwall is tricky but pumped arms can be rested at the obvious rest. Double bolt belay over the top and back a bit. The deceptively steep groove to the R of Bombs Away. Up past the bolt, then up crack line and R at the top. Start up Drop the Bomb, climb crux to good jug (and a cam if you want). Span right to great pocket and bolt then head up and right wards to 'the edge' on Clip or Fly. Finish up this route. Starts to the right of Drop the Bomb. Climb the vague arête and head right to the knee bar on Clip or Fly and finish on this route. The prow left of Scratching Julius. Shares the same start. The obvious steep crack at the left end of the face. Technically only grade 17 climbing, but extremely sustained and powerful. Finish straight up (although R is easier). Good pro. Bolt chain belay at top of Bombs Away. Pumpy climbing on good spaced holds. Four bolts. The weakness 3m R of Scratching Julius. An old aid climb. Follow the crack past a bolt to a wire fixed to one of the old aid bolts. Move around L and up the crack line. Continue to top. Better than a work out at the gym. Strenuous and pumping. Start as for previous climb, but at the fixed wire continue straight up the wall to a further bolt protecting the top section. Bolt and chain anchor. The obvious crack line R of Mr Clean. A bolt at the start protects the crux, which is followed by a pump to the top. Good pro – though hanging around to get it in can be fun. Strenuous, so go fast. Has been top-roped by John Chambers in 52 seconds. Shares belay with Mr Clean. Route to the right of Citizen Kane. Span between the arêtes and head to jug and easier climbing to the Citizen Kane Anchor. Easiest to pre-place second draw. The line to the R of Citizen Kane. Sustained, with good pro. Just left of the descent gully.